No further comment on the cartoon, but on another tangent, it does make me think when I loudly protest about ‘my’ rights and ‘my’ entitlements……. if everything is Gift- a little more gratitude and humility? ‘And I’m telling you now that I am coming out as gay and founding the American socialist party’. Perhaps not. Ok, there were elections in the USA a day or so back. Not being American, there are certain things about USA politics that I do not get. Actually there are certain things about USA politics that most British people do not get: truly the USA and Britain are, as the venerable Tony Benn once observed, two countries seperated by a common language. 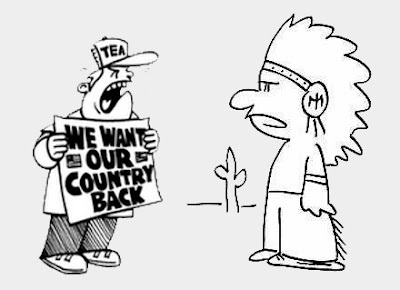 One thing I do not get is Republicanism and in particular its Tea Party side. I remember a satirical cartoon at the beginning of the week that said ‘75% of Americans could not find the earth on a map’. From what I have read and seen about Tea Party Republicanism across the pond I cannot understand how any person could believe and advocate what is espoused. A lot of it seems to be based on fear. This is the observation of an outsider, but it got me thinking: like them, am I known more for what I hate than what I love? One more post on this, then I go back to what I know: trivia and sardonic observations about pop culture.